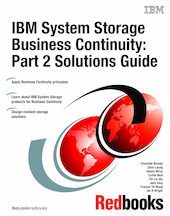 This IBM Redbooks publication is a companion to IBM System Storage Business Continuity: Part 1 Planning Guide, SG24-6547 . We assume that the reader of this book has understood the concepts of Business Continuity planning described in that book. In this book we explore IBM System Storage solutions for Business Continuity, within the three segments of Continuous Availability, Rapid Recovery, and Backup and Restore. We position these solutions within the Business Continuity tiers. We describe, in general, the solutions available in each segment, then present some more detail on many of the products. In each case, the reader is pointed to sources of more information.